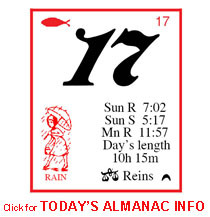 The Almanac Calendars have been manufactured for over 142 years and contains over 4900 bits of information including daily Fishing guides, Planting gardens by the signs, Sun rise and sun set times, and Weather. Breeding charts, Conversion tables, first aid, helpful hints are included on the extra 4 pages. 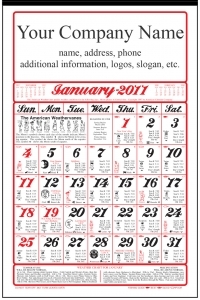 Our calendars are read 2.8 times per day....YOUR AD will be seen 1022 times for each calendar.